Of all the cruel punishments the Greek gods bestowed on humans (and one another), the punishment of Sisyphus has to be the worst. Sisyphus was the king of Ephyra and the son of Aelius (ruler of the winds and son of Poseidon…the guy has some serious lineage behind him). He was also a prideful, deceitful, murderous ruler; not only was he a chronic liar (deceiving both gods and humans), but he killed travelers and visitors for fun in his own kingdom. Basically, Sisyphus was a real prick. Apparently, after one too many deceitful and murderous acts, Zeus decided enough was enough and condemned Sisyphus to an eternal punishment. Except this wasn’t any old punishment. Zeus crafted something uniquely horrible for Sisyphus. 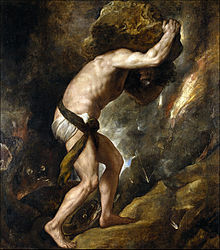 Zeus condemned Sisyphus to push a large bolder up a steep hill. Except, like all good Greek myths, there was a catch. Anytime Sisyphus came close to the top of the hill with the bolder, it would slip through his hands, rolling all the way back down to the bottom. No matter how Sisyphus approached the challenge, his effort was futile. An eternity of useless, infuriating effort with no payoff. In a lot of ways, entrepreneurship, art, and writing feel the same way. We spend hours, weeks, months (years in some cases) working on a project, only to launch it and…people don’t like it, people hate it, or, worst of all: people ignore it. Oftentimes, success feels like the bolder of Sisyphus, slipping through our hands every time right before we reach the top. And if you’re committed to your work / art / writing, the work we do can sometimes feel infuriating futile. Our work isn’t futile by nature. Every climb to the top of the mountain results in experience, lessons learned, and most of all growth. The climb to the top isn’t futile, IF we learn the right lessons and apply them in future endeavors (and we’re not simply repeating the same motions as before). A few weeks back, I had the opportunity to sit down with Andrew Warner to interview him for the next issue of Bootstrapped Magazine (the next issue comes out in two weeks, and the new website is under-construction, so stay tuned). Andrew is the founder of Mixergy.com, one of the premier business training websites in the world. Andrew has interviewed over 1,000 entrepreneurs, business owners and CEOs, from the founder of AirBnB.com to Groupon to LinkedIn to Wikipedia (and everything in between). The point is: he’s spoken to a lot of high-performers – men and women who have started and operated successful companies, many from scratch. With so many interviews under his belt, Andrew probably knows a thing or two about what works…and what doesn’t. Which is why I wanted to ask him that exact question. The following is a small excerpt from the interview I did with Andrew Warner that will be featured in the next issue of Bootstrapped Magazine. Andrew dishes a lot more gold than this in a lot more detail, so if you enjoy this, you can preorder your copy today. TOM: What is the most common problem entrepreneurs’ deal with when they are just starting out? From the interviews you’ve conducted, what have you found to be the biggest mistake most entrepreneurs make right at the beginning? ANDREW WARNER: I’ll tell you it happens so much that people must be tired of hearing me saying it, it’s the same mistake I made. I thought I knew what an invitation site was like because I organize events: “In a few hours I’m going to have some people come to the office for a little event here; on Sunday I’m going to have people come over for brunch in my house,” etc. I organize events all the time. I use invitations all the time. I thought I knew everything. I didn’t realize that we all have our own unique experiences and if we just try to deal with our own pain and our own needs we are not going to necessarily address what other people need. That’s the problem that I see over and over. It turns out people who are looking to study for big tests do not trust the community. They want someone that they can put their faith in, who is the expert, who has been doing this for years, who can guide them flawlessly or as close to it as humanly possible. They discovered, the whole idea of community-generated questions was just never going to work, and so they scrapped it and went in a different direction. They actually started building a small site using nothing but Balsamiq mockup software and PowerPoint…Then that started to work because they took it out to people and said, “Would this make sense for you?” And they took the feedback and adjusted until they had something that worked…This is a common story that you hear over and over and over again and we still all make that mistake. TOM: So what are the most common traits of successful entrepreneurs? ANDREW WARNER: You know Mark Suster, the venture capitalist, told me that he likes to invest in entrepreneurs who have a chip on their shoulder. I’ve never heard anyone say that they want to work with entrepreneurs who have a chip on their shoulder. So I’ve been giving that some thought as I’ve been doing my interviews and what I realized is that there are entrepreneurs who take these setbacks that we all have — the criticism that we all get from the world — and they use it to their advantage. One entrepreneur told me that every time a venture capitalist turned him down, he added that guy’s name to a list so that when he succeeded he could look back at all the people who missed out. #1: you don’t know the problem or solution – your customer does, so don’t assume anything (ask, learn, and test). #2: you’re going to fail but successful entrepreneurs turn failure into fuel for their fire, setbacks into assets, and anger into positive change. This is the type of advice that can be hard to hear. And it’s especially uncomfortable if you’ve continued to try to solve your own problem (without figuring out what people want) or if you base your ideas on the opinions of others (instead of turning that into motivation to prove them wrong). While your own situation might seem insurmountable – a giant bolder that needs to be pushed to the top of a mountain – it isn’t. Everything that stands in front of us in this life is conquerable, from writing, to art, to entrepreneurship. The question is: are you willing to learn, grow, and adapt from your failures; to approach the obstacle that defeated you last time in a new way, with new techniques and strategies; to pivot, even if you’re not sure how, to make something happen (no matter how much it pains you to abandon your first idea)? I’m writing a book on entrepreneurship, collaborative project development, and how to lead a team to ship a product to market. I explain in-depth how to apply the lessons covered in this blog post (and more) to help you successfully turn your idea into a profitable product or service. Stay vertical…keep those fluids moving. If this was your first health setback on the road, you have been one enormously lucky dude. Kathy and I have been following the both of you the whole way…..Courtney is one head-standing young lady. I’m doing yoga now (Kathy is back instructing after the revision surgery) and intend to be doing that head stand stuff myself…..within 5 years! Never tire of hearing the wisdom and experience of Andrew Warner. I’ve been a Mixergy premium member for two years because he’s a genius interviewer and always, always asks the questions I would ask – and is unafraid to take his guest deep into their experience for the benefit of his folks. Look forward to Issue #2 and reading the full interview….